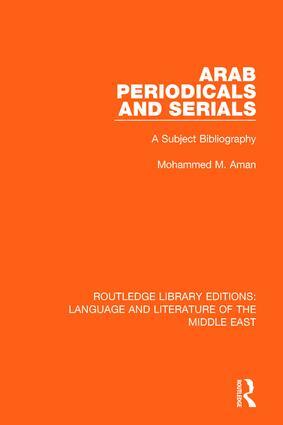 This bibliography, first published in 1979, is a guide to serials and periodicals in Arabic, English, French and other European languages published in the Arab countries or in the Western hemisphere. Arab serials and periodicals are considered primary sources of information on subject matters related to the Arab world. Lack of comprehensive bibliographies of Arab serials in the English language has hindered the work of librarians and Middle East specialists who need to identify a large number of such publications published in and about the Arab world. This bibliography is a research tool designed specifically to fill that gap. Agriculture. Arabs Abroad. Archaeology. Art and Architecture. Banking and Finance. Bibliographies. Biological Sciences. Building and Construction. Business and Industry. Chemistry. Children and Youth. Christianity. Communications. Computer Sciences. Criminology and Law Enforcement. Earth Science. Economics. Education. Electricity and Electrical Engineering. Engineering and Technology. General Periodicals. Humanities, History and Philosophy. Indexes and Abstracts. Islam. Labor and Industrial Relations. Law. Library, Archives, and Information Science. Linguistics. Literature. Management. Mathematics. Medical Sciences. Meteorology. Middle East Studies. Military Science. Motion Picture Industry. Music. Official Gazettes. Petroleum. Physics. Political Science. Population Studies. Psychology. Public Administration. Science. Social Science and Sociology. Social Services. Sports. Statistics. Transportation. Travel and Tourism. Water, Water Resources and Oceanography. Women.